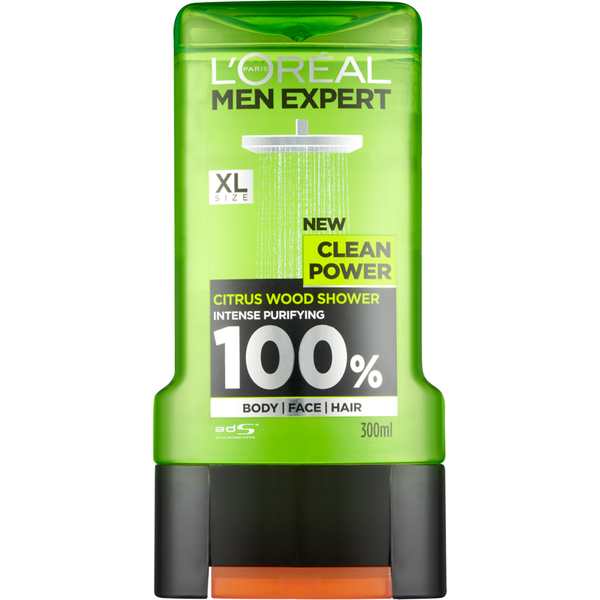 L’Oreal Paris presents the Men Expert Clean Power Shower Gel, the ultimate 3-in-1 product for face, body and hair. Foaming into a rich lather, the gel works to deeply cleanse skin and eliminate toxins, sweat and other impurities for that ultra-fresh clean feeling. It’s enriched with Citrus Fruits and Peppermint for an invigorating fragrance to revitalise and uplift the senses. 744756 03, Aqua/Water, Sodium Laureth Sulfate, Glycerin, Sodium Chloride, Coco-Betaine, Parfum/Fragrance, CI 19140/Yellow 5, CI 42090/Blue 1, Sodium Benzoate, Sodium Acetate, Sodium Hydroxide, PPG-5-Ceteth-20, Polyquaternium-10, Salicylic Acid, Limonene, Linalool, Pentylene Glycol, Mentha Piperita Extract/Peppermint Extract, Isopropyl Alcohol, Geraniol, Citrus Limon Fruit Extract, Lemon Fruit Extract, Citronellol, Citric Acid, F.I.L. C183951/1.